Nice game! Looks really great in the CGA-PICO8 palette:) I had to mash myself but feel like a winner in the end. Would be cool to shut down some computer controlled Nacho's but AI is hard. Thank you! AI is on the way but it has been very challenging! Soon I also hope to add combo attack bonuses. Had a blast beating the snot out of our friends, and the ability to get up after being knocked-down was a great addition. What a nice thing to say! Thank you! Honestly, I haven't been able to play test it with anyone, so I'm tickled that It worked out okay for you all. 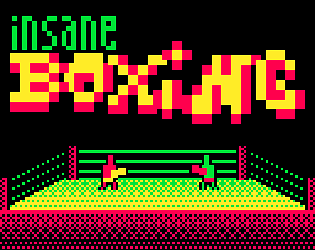 What a gloriously dithered boxing ring! This seems very cool but unfortuantely I have no friends to play against, yet somehow I managed to lose when P2's punch button got stuck on and had me pinned against the ropes. 10/10 would lose to stuck key again. Pico-8 games all have these controls: x,z, arrow keys for player 1. Q, w, ESDF for player 2. I'll admit they are unusual. The html5 version may first need to be clicked on with the mouse to obtain focus.